It seems that nearly every day a new LED wash unit debuts on the market, creating a bewildering array of choices for consumers. In my never ending quest to keep the consumers abreast of the latest in LED wash technology. Chauvet’s LEDsplash 2 is a recent favorite LED wash of mine due to its power, quality, and slim profile. The LEDsplash 2 features 24 1-watt LEDs, each rated at 50,000hrs, and a 22˚ beam angle to give you flat, even, and rich color. Operable via DMX, stand alone, master/slave, and sound activation, the LEDsplash 2 is versatile and perfect for both stage & studio applications and indoor architectural applications. 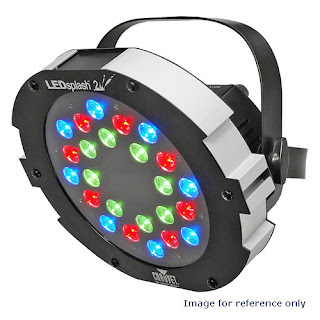 The LEDsplash 2 is excellent for the DJ or event planner on the go, 9.5in X 9in X 6.8in and a meager 4.7lbs, the LEDsplash 2 is simple to transport and set up. BulbAmerica understands that when it comes to LED wash units you have options, and plenty of them. That is why we stock only the highest quality and performance LED washes available. Be sure to check out all of our indoor and outdoor LED washes, you won’t be disappointed! As usual, leave a comment or question on our blog or Facebook or give us a call at 1-877-622-0897.